The clear blue skies in the background, the leafless trees and the snow-covered landscape; all the evidence points to an online slot machine with nature as it’s theme. 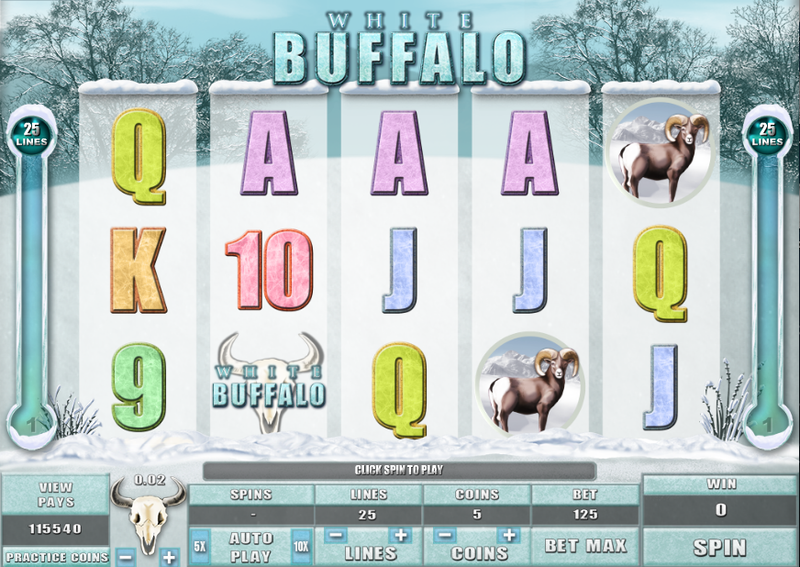 This is White Buffalo, a classy new game from Microgaming which features that most rare of creatures. White Buffalos are genetic anomalies and are so seldom seen that they have become spiritually important to a number of Native American tribes. This slot features five reels and twenty five paylines and the through the translucent reels we can see the wintry North American background. The soundtrack to the game somehow evokes that landscape and also those tribes. The main symbols are all animals and include a moose, an elk and a ram and of course the buffalo while the lower value symbols are 9, 10, J, Q, K and A. Special symbols are a circular talisman wild and a bleached white skull which acts as the scatter. Unlike most other slots, the bonus feature in this game is not activated by the scatter symbols; here the bleached white skulls just make winning combinations. Being scatter symbols they do not of course have to land on any paylines and the prize is the win multiplied by the total wager. So, you ask, how is the bonus feature in this game triggered? Easy, we reply, it’s randomly activated so you don’t have to watch the reels in constant hope of landing the right number of correct symbols. When it does happen you’ll receive six free spins and not only that, all the animals will turn into White Buffalos, obviously giving you loads more chances to create winning combos. It’s also possible for the free spins to be re-triggered while playing this feature. This game looks great – the graphics and animations and crisp and clear and the if you keep the soundtrack on it will provide an appropriate accompaniment to your slots session.